At 3:47 this afternoon, people had finished their lunch and as it was not nearly nice enough to go to the beach, most folks indulged in an afternoon of “lèche-vitrines”, literally “window-licking”, but of course more correctly translated as “window shopping”. 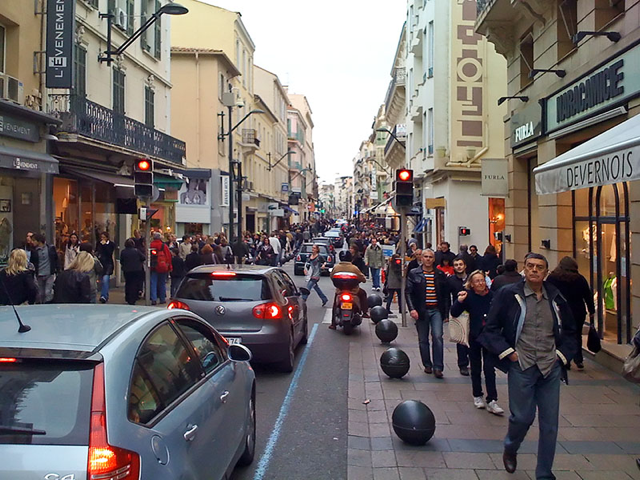 In Cannes, the street for that is the Rue d’Antibes, and whereas its sidewalks are not nearly as full as they will be in another month or two, they are already far busier than a few weeks ago. What were we doing in Cannes? I needed to get my hair cut, but as it turns out, the lady who usually takes care of that, gives superb head massages, and entertains me with funny stories of her children and husband was out sick, so we had lunch and joined the crowds on the Rue d’Antibes. There’s always next Saturday!